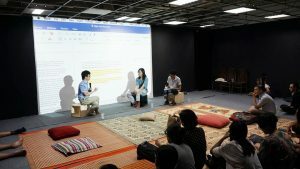 IN order to raise awareness and provide knowledge regarding critical theory and art trends in contemporary art in Asia and the World, as well as create a networking platform for local artists and writers to exchange with the international experts and their peers, Zero Station is presenting an Artwriting Workshop and a series of Public Talks. This program is part of the Asian In/VISIBLE Station (AIS) project, funded by the Japan Foundation – Asia Center and is curated by Zero Station. 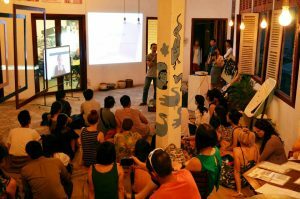 The 10-day Artwriting Workshop features a series of seminars, practical sessions and tutorials, aimed at developing art writers from Vietnam. The programme will take place at Zero Station, no. 12, road 43, Lam Van Ben Binh Thuan ward, District 7, Ho Chi Minh City. Participants of the workshop, selected through direct nominations from across the country, are young intellectuals who have been actively involved in the local art scene. They are curators, coordinators, writers, directors of art spaces… All of them are fluent in both speaking and writing in English. The overarching theme of the Workshop is “Translation: Understanding Difference and Distance in Contemporary Art across Asia”. We are using the term “Translation” more as a metaphor than in reference to the practices of translating different languages into each other. We are interested in exploring how artistic practice itself is a form of translation: a means of connecting and trying to understand the many geographic and cultural differences and distances that we find in contemporary societies around the regions. The Workshop is being facilitated by a curator and an art critic. Decades ago, one would expect an artwriting workshop to be conducted by an art critic. But today, contemporary arts discourse is as much led by curatorial practice as it is by art history and theory. It is therefore fitting to have these two perspectives guiding our Workshop. – The workshop will be conducted entirely in English. – The Workshop starts on April 18th till April 21st, off on April 22nd, and resumes on April 23rd till April 27th. April 22). The mornings are free for the Participants to do reading, writing and preparation for the Workshop. Workshop activities commence in the afternoon after lunch. In the evenings, there is a programme of Public Talks. 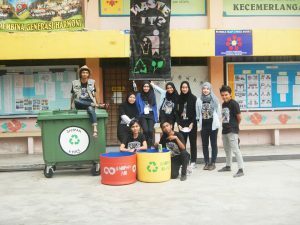 – Aside from the selected participants, a number of observers were also chosen and given an oppoturnity to attend 2 seminars from the facilitators and all the public talks. – ZeroStation will organize eat-in meals throughout the day for everyone who attends the workshop on site. Lee Weng Choy is president of the Singapore Section of the International Association of Art Critics. He was formerly Artistic Co-Director of The Substation, and has taught at the School of the Art Institute of Chicago, the Chinese University of Hong Kong, and the Sotheby’s Institute of Art, Singapore. 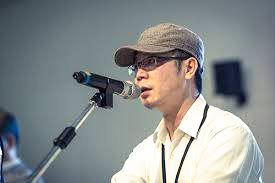 Lee has convened and participated in numerous conferences, and done project work with several arts organisations, including the NTU Centre for Contemporary Art Singapore and National Gallery Singapore. 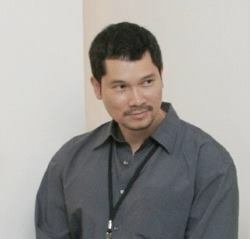 His essays, which discuss contemporary art and culture, Southeast Asia and Singapore, have appeared in such publications as: Modern and Contemporary Southeast Asian Art (Cornell); Over Here: International Perspectives on Art and Culture (MIT); and Theory in Contemporary Art since 1985 (Blackwell). He is currently working on a collection of his essays on artists, to be titled, The Address of Art and the Scale of Other Places. (on some evenings there may be 3). Each talk will last around 20–25 minutes followed by a 30-40 minute of an Q&A session in the end of the talks. – This series of talks will be open to public and will be announced on our facebook page and Zero Station’s website. 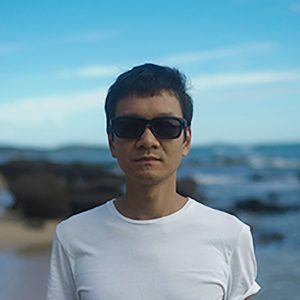 Koh Nguang How was born in 1963, Singapore, is an artist associated with art collective The Artists Village and independent researcher on Singapore art. He worked as a curatorial assistant at the Singapore National Museum Art Gallery from 1985-1991. He artistic practice encompasses photography, collage, installation, performance art, archiving and curating. 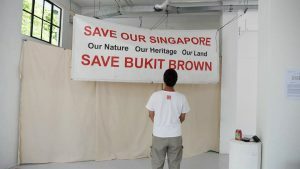 He started exhibiting art archives as early as 1992 in “Performance Week” at Gallery 21, Singapore. He created “The Singapore Art Archive Project” in 2005 and subsequently exhibiting the project in parts and as a whole in several events including 3rd Singapore Biennale, inaugural Singapore NTU CCA Residencies and opening of Asia Culture Center, Gwangju, S. Korea. 98B COLLABoratory is an artist-run initiative and space in Manila, Philippines. We are a community + network + library + kitchen + shop. The idea is to have a setting where artists and creative individuals from other disciplines can interact and work together while presenting art, design and creativity in different ways; be it a talk, a bazaar, a publication, a meal or a simple gathering. It is a multi-disciplinary art laboratory that seeks to establish a convergence with artists, designers, curators, writers, musicians, film makers, activists, educators, researchers, cultural workers, performers, architects and students together with the general public. Gong Jow Jiun was born 1966 in Chayi, Taiwan. 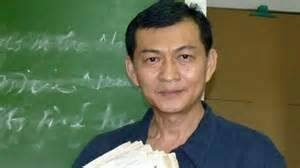 In 1998, Gong graduated from the Department of Philosophy of the National Taiwan University with his dissertation Dialectics between Body and Imagination: Nietzsche, Husserl, Merleau Ponty. 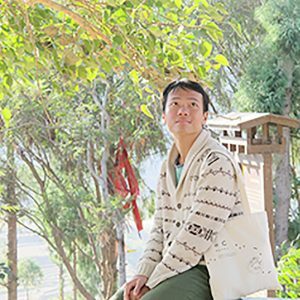 After teaching positions at several universities in Taiwan, in 2007, he was appointed as a associate professor and director of the doctoral program in art creation and theory at the Tainan University of the Arts. 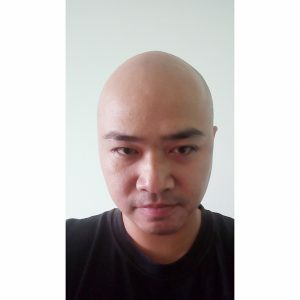 From 2009, he also organized the quarterly art magazine Art Critique in Taiwan (ACT), as chief editor and chairman and established it as a public journal. One year later, in 2010, the ACT won the Prize of National Publication as Outstanding Cultural Magazine. Besides his research, Gong has been involving in curatorial activities. In 2013, he curated the exhibition ‘Are We Working too Much?’ at the Eslite Gallery, Taipei. Related to the exhibition, he published two books, Are We Working too Much? I: Workbook, Are We Working too Much? II: Field Narratives. His recent curatorial practice was the show called “The return of the Ghosts” in 2015 and published two books in the same title, for which he is the co-curator (with Nobuo Takamori) supported by Taipei Honga Museum. From 2016-2017, he is the chief curator of Mutual Companionship in Near Future: Soulangh International Contemporary Art Festival which have invited 38 international artists showing their works in Tainan city. 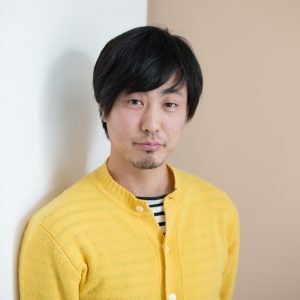 Takamori Nobuo is a curator with half Taiwanese & Japanese background, who born in Taiwan and work in Taipei now. 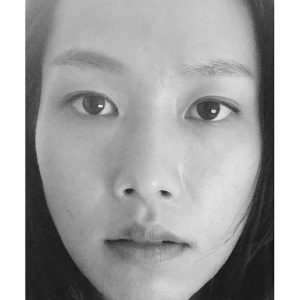 Takamori is also a PhD candidate of Taiwan’s National Chiao -Tung University and instructor of Taipei National University of Arts. 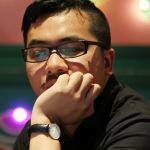 Meanwhile, he is also an independent art writer, whose articles have been issued in several magazines or Medias in Taiwan and Asia. His curatorial work focus on making connections between Taiwan, Southeast Asia, South Asia and Latin America. For achieve this ideology, Takamori established Outsiders Factory, a curatorial team in 2009. This group constituted by young curators work on making more connections and experimental collaboration with Southeast & South Asia. 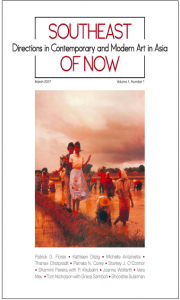 SOUTHEAST OF NOW: Directions in Contemporary and Modern Art in Asia was established by a collective of scholars and curators with the aim of looking and listening closely to the discursive spaces of art in, from, and around the region we refer to as Southeast Asia, from an historical perspective. The journal presents a necessarily diverse range of perspectives not only on the contemporary and modern art of Southeast Asia, but indeed of the region itself: its borders, its identity, its efficacy, and its limitations as a geographical marker and a conceptual category. As such, the journal is defined by a commitment to the need for and importance of rigorous discussion, of the contemporary and modern art of the domain that lies south of China, east of India, and north of Australia. 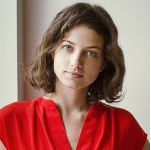 Isabela Herig is an independent researcher based in London. 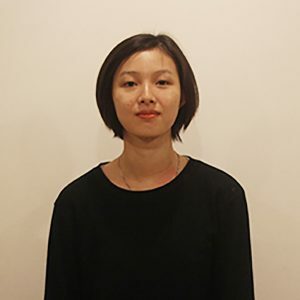 Having worked as a photographer and a designer, she is currently enrolled at the School of Oriental and African Studies, University London, and will soon be graduating with a BA in History of Art with a focus on Southeast Asia. Her research interests include contemporary women artists in Indonesia and digital strategies in curatorship and communication. 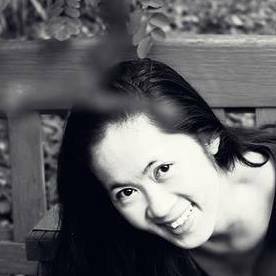 Nguyen Thu Giang is a lecturer in media studies at the Vietnam National University. She has recently completed her doctorate at the University of Queensland under the Australia Awards Scholarships. Her thesis investigates the relationship between Vietnamese popular television and the remaking of nationhood in post-Reform Vietnam. In 2015, Giang was the winner of the John McCullough Memorial Prize at the University of Queensland for best graduate writing. Giang has published her work on nostalgia and television drama in Media International Australia, a highly respected media studies journal. She also contributed a book chapter on the rise of commercial nationalism in Vietnam in a Palgrave MacMillan collection. She is now completing her book with Routledge based on her thesis. The book is to be published in 2018 and is entitled Television in Post-Reform Vietnam: Nation, Media, Market. Giang has a keen interest in engaging with Vietnamese media beyond the stereotype of socialist censorship. 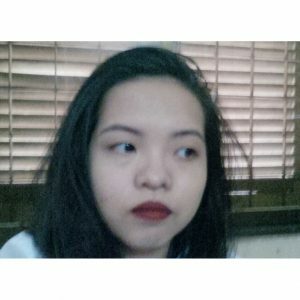 Currently, she is working on a project about the relationship between social media and the affective economy of fear in Vietnam through the case study of the food and environment panic. She also investigates the politics of memory manifested in Vietnamese popular television. Giang is highly committed to public education in Vietnam. She is teaching various courses on media theories for junior students at the Vietnam National University, a task she enjoys enormously. She also published many journal articles and book chapters in the Vietnamese language to introduce cultural studies to local readers. 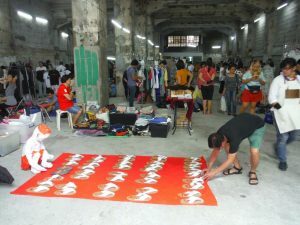 Sao La is a non-profit and independent art project/collective based in Saigon – Ho Chi Minh City, focusing on relationship among artists, community and art itself. 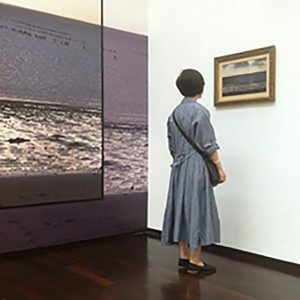 As the nature of a “space traveler”, not based on a fixed location, Sao La carries two main objectives: making contemporary art accessible to the general Vietnamese public through educational programs, and nurturing Vietnam’s growing creative community. The project will serve not only as a project that organizes exhibitions, film and video screenings, workshops and lectures but also as an informal place for Vietnamese artists to experiment, challenge and develop their creative practices. Found only in the Annamite mountain range of Vietnam and Laos, Sao La is the name of one of the world’s rarest mammals. The word ‘sao’ on its own can signify ‘star’ or pose the questions ‘how?’ ‘what?’ or ‘why?’ ‘La’ suggests a shriek, call or shout. An independent art space in Hanoi, originated from Nha San Studio, the longest running non-profit experimental art space in Vietnam. 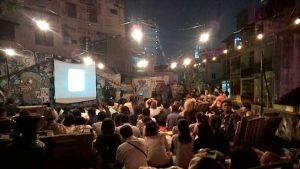 Since the establishment in 2013, Nhà Sàn Collective has organized a series of mobile and guerrilla projects in public spaces as well as large scale projects with international institutes in Vietnam and abroad. Dedicated to examining local and global socio-political contexts and history, we support each other in pushing the boundaries of expression in Vietnam, with or without a physical space. 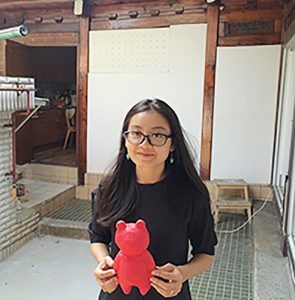 Their mission is to build a stable structure for contemporary art to grow in Vietnam. Through exhibitions, projects, education and exchange, we cultivate, support and challenge artists, creating room for new forms of expression and dialogue to thrive in Vietnam. A collective made up of 5 members, most of them are practicing artists: Phan Quang, Tran Nguyen Uu Dam, Hoang Duong Cam, Nguyen Truc, Quang Lam. Their unique way of operate is functioning entirely as an art space but in print material. NHẰM mục đích nâng cao nhận thức và cung cấp tri thức về lý thuyết phê phán và các xu hướng nghệ thuật trong nghệ thuật đương đại châu Á cũng như thế giới, đồng thời tạo ra một trạm kết nối giúp nghệ sĩ và các cây viết địa phương trao đổi với các bè bạn đồng nghiệp trên thế giới, Ga 0 tổ chức một workshop viết về nghệ thuật cùng một loạt các buổi trình bày của các khách mời châu Á và địa phương. Workshop này là bộ phận của dự án trạm ẨN/HIỆN châu Á do Trung tâm Châu Á, quỹ Nhật Bản và Ga 0 đồng tổ chức và do Ga 0 giám tuyển. 10 ngày workshop viết về nghệ thuật bao gồm các buổi thảo luận chuyên sâu, thực hành viết, và phụ đạo trực tiếp, nhằm mục đích phát triển các nhân sự viết về nghệ thuật tại Việt Nam. Tất cả đều diễn ra tại trung tâm nghệ thuật độc lập Ga0, số 12, đường 43, Lâm Văn Bền, phường Bình Thuận, quận 7, Tp. HCM. Chủ đề bao quát của workshop là “ Sự thông dịch: Hiểu về Sự Sai Khác và Khoảng cách trong nghệ thuật đương đại châu Á”. Chúng tôi sử dụng thuật ngữ “thông dịch” ở đây nhiều phần như một ẩn dụ chứ không phải như một thực hành dịch thuật ngôn ngữ này sang ngôn ngữ khác. Chúng tôi quan tâm tới việc khảo sát một cách thực hành nghệ thuật tồn tại như một sự thông dịch; tức một phương tiện để kết nối và để hiểu nhiều sự sai khác về văn hoá và địa lý trong các xã hội đương đại ở khắp các khu vực. Lee Weng Choy là chủ tịch Ban Singapore của hiệp hội các nhà phê bình nghệ thuật quốc tế (AICA). 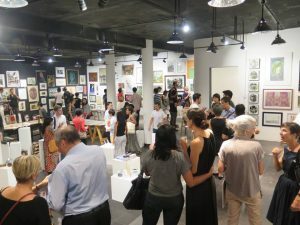 Anh từng là đồng giám đốc của Trung tâm nghệ thuật Tiền Trạm (Substation Art Center) ở Singapore và đã giảng dạy tại Đại học Trung văn Hương Cảng; Học viện nghệ thuật Sotheby, Singapore; và Học viện nghệ thuật Chicago. Lee từng tổ chức và tham gia vào nhiều hội nghị, và đã làm việc với nhiều tổ chức nghệ thuật bao gồm Trung tâm nghệ thuật đương đại Singapore NTU và Phòng trưng bày quốc gia Singapore. Các tiểu luận bàn về nghệ thuật đương đại và văn hoá, Đông Nam Á và Singapore của anh đã xuất bản trong những ấn phẩm như: Lý thuyết nghệ thuật từ 1985, Nghệ thuật Đông Nam Á hiện đại và đương đại ( Cornell); Ở Trên Đây: Các quan giác về nghệ thuật và văn hoá quôc tế ( MIT); Lý thuyết nghệ thuật đương đại từ 1985 (Blackwell)… Hiện nay anh đang thực hiện một tuyển tập các tiểu luận của mình về các nghệ sĩ có tên là Địa chỉ của Nghệ thuật và Quy mô các Địa điểm khác. Sáng lập liên hoan Queer Forever! – Các buổi nói chuyện cộng đồng sẽ được tổ chức bằng tiếng Anh có phiên dịch tiếng Việt tại Ga0 mỗi buổi tối từ ngày 18 đến ngày 26 tháng 4. – Mỗi buổi Nói chuyện Cộng đồng sẽ bao gồm ít nhất 2 diễn giả (vào một vài buổi sẽ có thể có 3 người). Mỗi buổi nói chuyện sẽ kéo dài từ 20-25 phút. Sau khi cả 2 diễn giả trình bày xong, sẽ có phần hỏi đáp diễn ra trong khoảng 30-40 phút. – Loạt nói chuyện này sẽ được mở cửa tự do cho tất cả mọi người và sẽ được công bố sau trên trang facebook và website – của chúng tôi để đăng ký. – Người nghe được khuyến khích mang theo đồ ăn vặt và thức uống đến để cùng chia sẻ với mọi người. Koh Nguang How sinh năm 1963 tại Singapore. Anh là một nghệ sĩ thành viên của nhóm Làng Nghệ Sĩ đồng thời là một nhà nghiên cứu về nghệ thuật Singapore. Koh Nguang How từng làm việc tại Bảo Tàng Nghệ Thuật Quốc Gia Singapore với vai trò trợ lý giám tuyển từ 1985 – 1991. Các thực hành nghệ thuật của anh bao gồm nhiếp ảnh, nghệ thuật collage, sắp đặt, trình diễn, lập thư khố và giám tuyển. Anh bắt đầu triển lãm các bộ thư khố nghệ thuật vào năm 1992 tại Gallery 21 trong chương trình “Performance Week (Tuần trình diễn)” tại Singapore. Năm 2005, Koh Nguang How xây dựng “Dự án thư khố nghệ thuật Singapore” và sau đó triển lãm từng phần hoặc toàn bộ dự án tại một số sự kiện bao gồm Triển lãm lưỡng niên Siangpore lần 3, lễ khai trương chương trình nhiệm trú Singapore NTU CCA và khai trương Trung Tâm Văn Hoá Châu Á tại Gwangju, Hàn Quốc. 98B Collaboratory là một không gian nghệ thuật do nghệ sĩ điều hành tại Manila, Philippines. Ý tưởng chính của nó là tạo nên một cơ chế làm việc nơi nghệ sĩ và các cá nhân sáng tạo từ các nguyên tắc khác nhau có thể tương tác và làm việc cùng nhau đồng thời có thể trình bày về nghệ thuật, sáng tạo và thiết kế theo nhiều cách khác nhau; Đó có thể là nói chuyện, hội hè, xuất bản, nấu nướng hay thậm chí chỉ là một buổi tụ tập. Đây là một không gian thử nghiệm nghệ thuật đa liên ngành nhằm tìm kiếm một sự hội tụ của các nghệ sĩ, nhà thiết kế, giám tuyển, cây viết, nhạc sĩ, nhà làm phim, nhà hoạt động, nhà giáo dục, nhà nghiên cứu, những người làm về văn hoá, nghệ sĩ biểu diễn, sinh viên và cộng đồng. Gong Jow Jiun sinh năm 1966 tại Chayi, Đài Loan. Năm 1998, Gong tốt nghiệp khoa Triết học của Đại học Quốc gia Đài Loan với luận văn của anh về Phép biện chứng giữa Thân Thể và Tưởng Niệm: Nietzsche, Husserl, Merleau Ponty. Sau khi giảng dạy tại một số trường đại học ở Đài Loan, năm 2007, anh được bổ nhiệm làm phó giáo sư và giám đốc chương trình tiến sĩ về sáng tạo và lý thuyết nghệ thuật tại Đại học Nghệ thuật Thành phố Đài Nam. Từ năm 2009, anh cũng tổ chức tạp chí nghệ thuật hàng quý Art Critique ở Đài Loan (ACT), làm tổng biên tập và chủ tịch đồng thời xây dựng nó như là một tạp chí dành cho cộng đồng. Một năm sau, trong năm 2010, ACT đã đoạt giải thưởng Ấn phẩm phát hành quốc gia như một tạp chí Văn hóa nổi bật. Gong cũng được nhìn nhận như một chuyên gia Trung Quốc chuyên dịch các tác phẩm của Gaston Bachelard, Maurice Merlau-Ponty và Carl Gustav Jung. Ngoài nghiên cứu của mình, Gong cũng tham gia vào các hoạt động giám tuyển. Trong năm 2013, anh đã tổ chức triển lãm Are we working too much? (Chúng ta đang làm việc quá nhiều?) Tại Gallery Eslite, Đài Bắc. Cùng với triển lãm, anh cũng xuất bản hai cuốn sách, Are we working too much? I: Workbook và Are we working too much? II: Field Narratives. Thực hành giám tuyển gần đây của Gong là chương trình The return of the Ghosts (Sự trở lại của những hồn ma) vào năm 2015 và xuất bản hai cuốn sách cùng tên, mà anh là đồng giám tuyển (với Nobuo Takamori) và được hỗ trợ bởi Bảo tàng Đài Bắc Honga. Từ năm 2016 đến năm 2017, anh là giám tuyển chính của Mutual Companionship in Near Future: Liên hoan Nghệ thuật Đương đại Quốc tế Soulangh và đã mời 38 nghệ sĩ quốc tế trưng bày các tác phẩm của họ tại thành phố Đài Nam. Takamori Nobuo là một giám tuyển mang hai dòng máu Nhật và Đài Loan, sinh ra tại Đài Loan và hiện đang làm việc tại Đài Bắc. Takamori cũng là nghiên cứu sinh tiến sĩ của Đại học Chiao -Tung của Đài Loan và là giảng viên của Đại học Quốc gia Đài Bắc. Trong khi đó, anh cũng là một cây viết về nghệ thuật độc lập, có nhiều bài báo được phát hành trong một số tạp chí hoặc truyền thông ở Đài Loan và Châu Á. Công việc giám tuyển của anh tập trung vào việc kết nối giữa Đài Loan, Đông Nam Á, Nam Á và Châu Mỹ Latinh. Để đạt được lý tưởng này, vào năm 2009, Takamori thành lập Outsider Factory, một nhóm này tập hợp các giám tuyển trẻ làm việc với việc tạo ra những kết nối và thử nghiệm hợp tác với Đông Nam và Nam Á.
ĐÔNG NAM TRONG HIỆN TẠI: Các hướng đi của nghệ thuật hiện đại và đương đại tại châu Á trong một tạp chí do một nhóm giám tuyển và học giả thành lập với mục tiêu hướng tới và lắng nghe sát sao các không gian diễn ngôn nghệ thuật trong, từ, và xung quanh khu vực mà chúng tôi coi là Đông Nam Á, từ một quan giác lịch sử. Tạp chí đưa ra một loạt quan đểm không chỉ về nghệ thuật đương đại và hiện đại của Đông Nam Á mà còn về chính khu vực: biên giới, bản sắc, hiệu quả và những hạn chế như một dấu hiệu địa lý và một hình thức khái niệm. Như vậy, tạp chí này được định nghĩa bằng việc tập trung vào sự cần thiết của một thảo luận nghiêm ngặt về nghệ thuật đương đại và hiện đại của khu vực nằm ở phía nam Trung Quốc, phía đông Ấn Độ và phía Bắc Australia. Isabela Herig là một nhà nghiên cứu độc lập tại London. Sau một thời gian làm việc như một nhà nhiếp ảnh và nhà thiết kế, hiện nay cô đang theo học tại Trường Nghiên cứu Phương Đông và châu Phi thuộc trường Đại Học London và sẽ tốt nghiệp cử nhân lịch sử nghệ thuật, tập trung vào khu vực Đông Nam Á. Các mối quan tâm nghiên cứu của cô bao gồm các nữ nghệ sĩ đương đại tại Indonesia và các chiến lược kỹ thuật số trong giám tuyển và truyền thông. Nguyễn Thu Giang là giảng viên trong lĩnh vực nghiên cứu truyền thông tại Đại học Quốc Gia Việt Nam, Hà Nội. Cô vừa hoàn thành chương trình Tiến sĩ tại Đại học Queensland theo diện học bổng Chính phủ Úc (AAS). Luận án của cô nghiên cứu về mối quan hệ giữa truyền hình đại chúng và việc tái thiết quốc gia giai đoạn sau Đổi mới ở Việt Nam. Năm 2015, Giang nhận được Giải thưởng Tưởng niệm John McCullough (John McCullough Memorial Prize) của Đại học Queensland cho luận án tốt nghiệp xuất sắc nhất. Giang đã xuất bản một công trình nghiên cứu về sự hoài niệm và phim truyền hình trên Media International Australia – một tạp chí có uy tín cao trong lĩnh vực nghiên cứu truyền thông. Cô cũng là đồng tác giả trong một cuốn sách viết về sự trỗi dậy của Chủ nghĩa dân tộc thị trường ở Việt Nam do tập đoàn Palgrave MacMillan tuyển chọn. Hiện cô đang hoàn thiện một cuốn sách khác do Routledge xuất bản phát triển từ chính luận án của cô. Cuốn sách dự kiến sẽ xuất bản vào năm 2018 dưới tên gọi, Truyền hình hậu Đổi mới ở Việt Nam: Quốc gia, Truyền thông, Thị trường. nghiên cứu văn hóa tới độc giả trong nước. Nhà Sàn Collective là một không gian nghệ thuật tại Hà Nội, phiên bản sau của Nhà Sàn studio, một trong các không gian nghệ thuật thử nghiệm phi lợi nhuận lâu đời nhất tại Việt Nam. Từ khi được thành lập vào năm 2013, Nhà Sàn Collective đã tổ chức một loạt các dự án di động và du kích tại các không gian công cộng cũng như các dự án có tầm vóc lớn hợp tác cùng các viện quốc tế tại Việt Nam và nước ngoài. Tập trung vào việc khảo sát các văn cảnh và lịch sử xã hội chính trị truyền thống, toàn cầu và địa phương, các thành viên hỗ trợ lẫn nhau trong việc đẩy lùi giới hạn của biểu hiện tại Việt Nam trong hoàn cảnh có hay không một không gian hoạt động vật lý. Nhiệm vụ của Nhà Sàn Collective là xây dựng một cấu trúc vững chắc để phát triển nghệ thuật đương đại tại Việt Nam. Thông qua các triển lãm, dự án, chương trình giáo dục và trao đổi, chúng tôi bồi dưỡng, hỗ trợ và thử thách các nghệ sĩ, kiến tạo không gian cho những hình thức biểu hiện mới và các đối thoại phát triển tại Việt Nam.